However, 95-year-old artist and teacher, Ilona Royce Smithkin, resists any notion that there is no beauty in aging or that older people should quietly fade away. In fact, she grows increasingly more bold with each day. We visited Ilona in her tiny New York City West Village apartment where she has lived for over 65 years. Everything about Ilona screams with color. 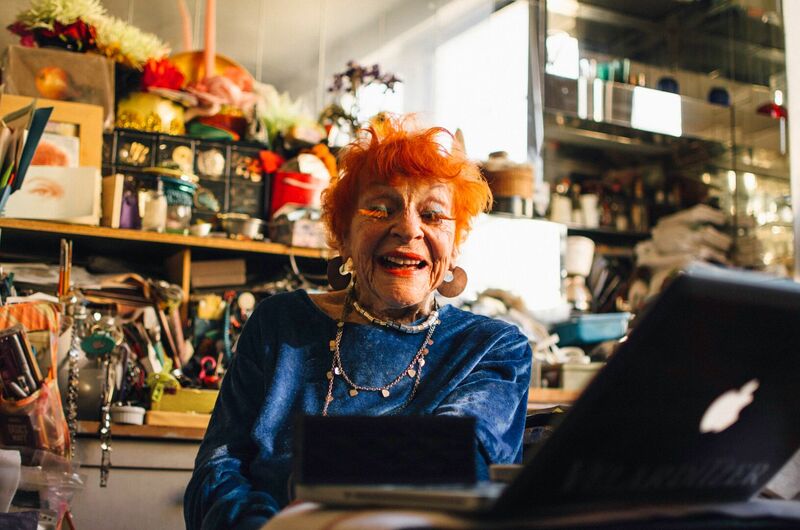 While many older people transition to more subdued, socially appropriate aesthetics, Ilona has become a NYC fashion icon because of her daring color choices and iconic handmade eyelashes. She insists on being seen. Her example has made many people rethink what growing older looks like. Featured in Seth Cohen’s glorious documentary, Advanced Style, Ilona represents one of the women who is deconstructing ageist ideologies that misrepresent the possibilities of aging and self-expression. Ilona’s philosophy and attitude are built on confidence and feeling strong about her identity in the same way that Krystal and Krista talk about their own experiences. In his book, Culture and the Human Body, John Burton describes the body as being like a “cultural mirror.” The choices we make are indicative of the societies that we live in. Whether it cranial shaping, corsets, or bright colors, how we dress and embellish our bodies are shaped by which social group we seek to communicate with. Our choices, however unique they may seem, are contextualized by the larger society. As such, when individuals of a group choose to adopt a look or an aesthetic that is outside of the mainstream, they become deviant. There is a wondrous beauty in those members of society that push the limits of what is deemed socially acceptable to negotiate what may eventually become our new normal.